Calling all motorsport lovers – Monster Jam, the world’s best truck line-up is heading to South Africa for the first time! Don’t miss the action-packed, adrenaline-pumping event set to rev up audiences throughout SA. Monster Jam is a family-friendly event perfect for adventure lovers and truck enthusiasts, featuring eight of the world’s most famous Monster Jam trucks, including the likes of Grave Digger®, Max-DTM, Monster Energy, Gas Monkey GarageTM, Megaladon®, ZombieTM, El Toro Loco® and Monster Mutt Dalmatian. Get your tickets to see world-class international male and female drivers set to battle it out for supremacy on the track while doing wheelies, donuts, obstacle course racing and freestyle competitions – such as doing backflips in 4 500kg machines! The larger-than-life spectacular kicks off with the Pit Party from 1pm on the day of the event, until 3:30pm. Fans can make the most of the opportunity to see the trucks up close before the main event – get up close to each Monster Jam truck, participate in fun activities and purchase official Monster Jam merchandise. Don’t miss out on the live motorsport action. 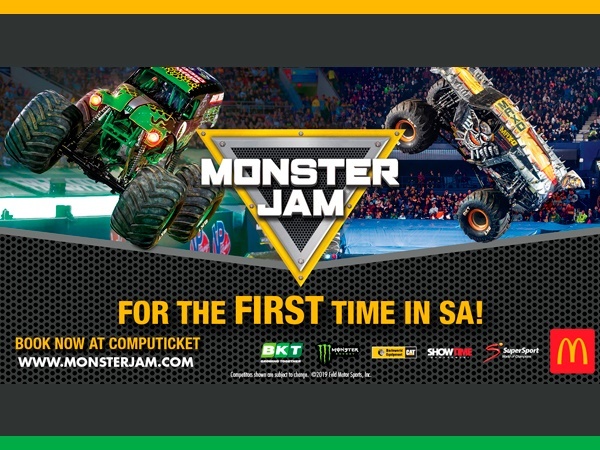 We’re giving away two sets of four family event tickets to attend Monster Jam at the Durban, Cape Town or Johannesburg leg of the tour. Simply SMS your answer to the question, followed by your full name, contact number, and address. to 33150. Question: Name one of the Monster trucks set to battle it out at the event. COMPETITION RULES, TERMS AND CONDITIONS: The competition runs from 4 April 2019 to midnight on 29 April 2019. You may enter as many times as you like. Each SMS costs R1,50. You must be the owner of the cellphone or have permission from the owner of the cellphone to use it to enter the competition. Tickets are only valid for the specified date and performance time and may not be upgraded, exchanged for cash or for an alternate performance. The prize comprises four combined entry only. Prize winners are responsible for their own transport arrangements. Any additional tickets may be purchased direct from Computicket (Jhb). We are unable to assist with bookings for additional tickets. A Computicket booking notice will be sent by email for the show. Prizewinners must please print and present at a Computicket outlet prior to the show date so that tickets may be processed. Lost tickets/vouchers will not be replaced. Staff and their families of Media24 and the prize sponsor may not enter. You have to send the correct answer to the question to stand a chance to win. Winners will be chosen by random draw and will be notified telephonically. If a winner can’t be reached within three calls during business hours, a new winner will be chosen. Not suitable for children under the age of 3 years of age, and for safety reasons no unaccompanied minors are permitted. Media24 and the prize sponsor take no responsibility for any damage caused by entering or taking part in this competition. Prizes are non-transferable and may not be exchanged for another prize or for cash. Media24 and the sponsor take no responsibility for loss of the prize should the winner not be present to receive it or neglect to collect it from a post office. By entering this competition, you consent to occasionally receiving promotional material from Media24.